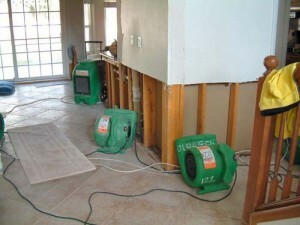 Water damage comes in a variety of ways and quantities, from simple seepage through cracks in the floor or foundation, leaky water heaters, and overflowing toilets or sinks to broken pipes, backed up sewers or septic systems, and outright floods from lakes and rivers. No matter what the source or cause, unwanted water can do enormous damage to your belongings and property, and must be dealt with quickly, decisively and professionally. At the first sign of unwanted water contact Done Right Carpet Restoration Inc. immediately! Our highly experienced professionals are available 24/7 to limit your damage and return your property to normal as quickly as possible. Our 20 years of experience allows us to quickly identify the source of the problem and do everything possible to stop it. We will then remove all your personal property from the affected area, employ our state of the art equipment in removing as much water as possible, and then begin drying the area with our high velocity fans and ventilation systems. Done Right Carpet Restoration Inc. expertise and quick action is essential in helping you limit damage. At the first sign of unwanted water, act quickly and decisively by calling the professionals at Done Right Carpet Restoration Inc.!